I’m running an Intel Octium processor now, with an over-the-air high speed wireless connection. Landline modems are a thing of the past. And my monitor is a state-of-the-art 40″ flat panel plasma display — but tonight, I’m using my headset. As the screen faded away, it was replaced by the now familiar logo of the USGS suspended over an image of their headquarters. Arrayed directly in front of me were the menu icons. I pointed deftly toward the 3rd icon (planets). The icons faded and were replaced with the spheres of 9 planets and a generic asteroid. I pointed again toward the 4th sphere (Mars) thinking “I really must try the Moon again some night.” The treadball’s stereo cameras saw my choice was Mars. Since I got PlaneTrek 5.0 I’ve been almost nowhere but the Red Planet, and these latest enhancements really make it an interesting trip! The newest version incorporates algorithms for changing the Sun angle and brightness, generating more realistic shadows from the topographic data base. You can actually watch a martian sunset if you’re in the right place at the right time. I’ve got two dates bookmarked when both Phobos and Deimos are visible in the darkening dusk. My reverie was interrupted by the next request, this time in Uncle Sam’s bland monotone. “SPECIFY COORDINATES…” “Longitude 60, latitude negative 15” I replied, thinking how nice it would’ve been if they’d used Shatner’s or Stewart’s voice print as an audio envelope. “DATA DOWNLOADED. THANK YOU FOR USING USGS.” As my Octium-based system began crunching the voluminous database through its parallel board, I watched the Red Planet icon spin slowly in the distance, growing ever larger as PlaneTrek’s photoplanimetric routine neared completion. “SPECIFY TIME” my PC queried. “1800 hours, UT” I replied. The view went black, then slowly ramped up to full brightness. I was on the surface of Mars. As I hiked the short distance to the edge of Valles Marineris I marveled at the detail created by the new fractal surface emulations. “Too bad this headset can’t generate fractional gravity,” I thought, as I rounded a small knoll near an old crater. The Sun slowly came into view, perched a few degrees above Ophir Planum beyond the north rim of the canyon. It was still about half a kilometer to the south rim, but I always enjoyed the hike. As I approached the edge of the canyon, the bottom limb of the Sun was just touching down. Eerie hues played across the canyon walls as the tiny disk dropped rapidly out of view in the salmon-colored sky. Sunsets don’t last that long on Mars — the solar disc is about 67% the size seen from Earth, and Mars rotates only 3% more slowly than Earth. Darkness descends rapidly over the landscape, as the thin martian atmosphere provides little twilight scattering. Are we there yet? Pretty close as it turns out, but it took a bit longer than my estimate of 10 years. 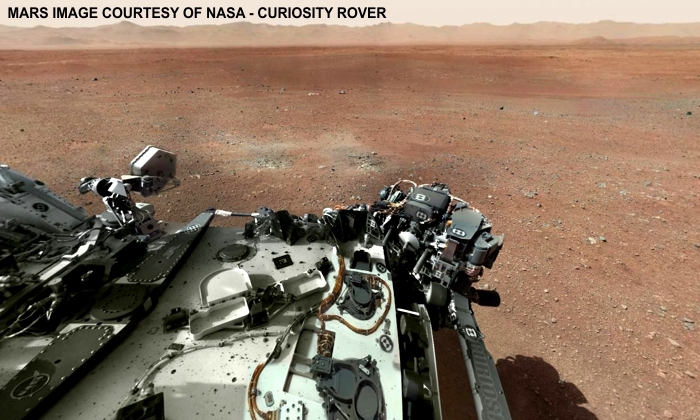 If you go to this link (which was the source of the top graphic) you’ll be able to view the surface of Mars from NASA’s Curiosity Rover, and control the direction and zoom of the camera. If you want a compatible VR headset, check out the choices currently available. I haven’t bought mine yet, but the future is here. Unfortunately, nobody (yet) is making treadballs.